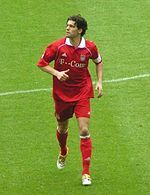 Michael Ballack (German pronunciation: [ˈmɪçaːʔeːl ˈbalak]; born 26 September 1976) is a retired German footballer. He is among the top goal scorers in the history of the German national team. Ballack wore the number 13 shirt for every team he has played for, save for 1. FC Kaiserslautern. He was selected by Pelé as one of FIFA's 125 Greatest Living Players, and as the UEFA Club Midfielder of the Year in 2002. He won the German Footballer of the Year award three times – in 2002, 2003 and 2005. Ballack was known for his passing range, powerful shot, physical strength and commanding presence in midfield. What's the good word on Michael Ballack?